Visiting US President Donald Trump held a news conference today after talks with British Prime Minister Theresa May. 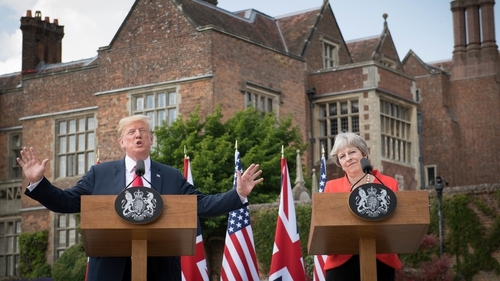 Earlier, in a combative newspaper interview, Mr Trump had delivered a withering verdict on Mrs May's Brexit strategy, criticised London Mayor Sadiq Khan and tipped Boris Johnson, who resigned this week, as a future British leader. "I didn't criticise the Prime Minister, I've a lot of respect for the Prime Minister." "Unfortunately, there was a story that was done which was generally fine, but it didn't put in what I said about the Prime Minister and I said a tremendous thing." "It was just an unfair situation. The United States was paying anywhere from 70 to 90 and I choose 90 depending on the way you want to calculate, we were paying 90% of the cost of NATO, and NATO is really there for Europe much more than us. It helps Europe more than it helps us. That being said, it is a great unifier. We have 29 countries and there is a lot of love in that room. "That being said, we're helping Europe, they're helping us,we're all together and I'm fine with it." "I also want to thank Prime Minister May for pursuing fair and reciprocal trade with the United States. Once the Brexit process is concluded and perhaps the UK has left the EU, I don't know what they're going to do but whatever you do is okay with me, that's your decision. "Whatever you do is okay with us, just make sure we can trade together, that's all that matters. The United States looks forward to finalising a great bilateral trade agreement with the United Kingdom. This is an incredible opportunity for our two countries and we will seize it fully." "I would say I would give our relationship in terms of grade the highest level of special. We start off with special, I would give our relationship with the UK and now especially after this two days with your prime minister, I would say the highest level of special. Am I allowed to go higher than that? I'm not sure but it's the highest level of special. They're very special people, it's a very special country and as I said I have a relationship because my mother was born in Scotland." "This incredible woman right here is doing a fantastic job, a great job. "I think she's a terrific woman. I think she's doing a terrific job and that Brexit is a very tough situation ... between the borders and the entries into the countries and all of the things. "The only thing I ask is that she work it out so that we can have very even trade because we do not have a fair deal with the EU right now on trade. They treat the US horribly and that's going to change. "If it doesn't change, they're going to have to pay a very big price. "She's a very smart, very tough, very capable person, and I would much rather have her as my friend than my enemy. That I can tell you. "The only thing I ask of Theresa is that we ensure we can trade, that we don't have any restrictions, because we want to trade with the UK and the UK wants to trade with us. "If they're going to go a certain route, I just said that I hope you're going to be able to trade with the United States. I read reports where that won't be possible, but I believe after speaking with the Prime Minister's people, the representatives and trade experts, it will absolutely be possible. "As far as the advice, I did give her a suggestion, I wouldn't say advice, and I think she found it maybe too brutal and that's..because I could see that ... I did give her a certain amount of ... I gave her a suggestion not advice ... I can fully understand why she thought it was a little bit tough and maybe someday she'll do that if they don't make the right deal, she might very well do what I suggested that she might want to do but it is not an easy thing. "Look at the United States how the European Union has taken advantage systematically of the United States on trade. It's a disgrace, so it's not an easy negotiation. "They (The Sun) asked about Boris Johnson ... how he would be as a Prime Minister. "He'd be a great Prime Minister, he's been very nice to me, he's been saying very good things about me as president, I think he thinks I'm doing a great job. I am doing a great job." "I think it's changing the culture, it's a very negative thing for Europe. I know it's politically not necessarily correct to say that, but I'll say it loud. European countries, he said, had better "watch themselves". "You are changing culture, you're changing security - look at what's happening to different countries that never had difficulty, never had problems. It's a very sad situation, it's very unfortunate, but I do not think it's good for Europe, and I don't think it's good for our country." "We discussed a range of priorities including stopping nuclear proliferation. I thanked (May) for her partnership in our pursuit of a nuclear-free North Korea. We both agreed that Iran must never possess a nuclear weapon." The Crimean peninsula was annexed from Ukraine by President Vladmir Putin in February/March 2014. "President Obama failed very badly with Crimea," Mr Trump said. "I don't think he would have done that if I had been president. This was an Obama disaster. "Crimea was another bad hand I took over. We will look at that just like I'm looking at many other disasters that I've taken over. I've taken over a lot of bad hands and I'm fixing them one by one - and I know how to fix them." "On Russia, I thanked President Trump for his support in responding to the appalling use of a nerve agent in Salisbury. "We agreed today that as the UK leaves the European Union we will pursue an ambitious U.S.-UK free trade agreement. The Chequers agreement reached last week provides the platform for Donald and me to pursue an ambitious deal that works for both countries right across our economies. "For generations our predecessors have gathered at this stunning retreat to strengthen a bond that is like no other. The relationship between our two nations is indispensable because of liberty, justice and peace." "It is all of our responsibility to ensure the transatlantic community endures, for it has been fundamental to the protection and projection of our interests and values for generations. "I am confident that this transatlantic alliance will continue to be the bedrock of our shared security and prosperity for years to come."